When Star Wars and Saturday Night Live cross paths, good things happen. The latest SNL sketch to take place in a galaxy far, far away once again proved this to be true. J.J. Abrams appeared in a hilarious spoof to help jokingly introduce the next Star Wars standalone movie, The Mos Eisley Five: A Star Wars Story. The sketch brilliantly takes apart some very old Star Wars tropes and is absolutely hilarious, but for some reason didn't air with the episode and was cut for time. Luckily, the folks from NBC and SNL uploaded the sketch online. Essentially, we have a group known as The Mos Eisley Five, which consists of Mikey Day, Kate McKinnon, Charles Barkley, a new droid and a Wookiee. They have to save their Rebel pilot buddy who's been captured, played by Pete Davidson. The group has to try and make a deal with Goba, an alien very similar to Jabba the Hutt, played by Kenan Thompson. Here's how J.J. Abrams set up the sketch. "This summer, the second standalone Star Wars film, Solo: A Star Wars Story, directed by the great Ron Howard, will hit theaters. For the summer of 2019, get ready for another: The Mos Eisley Five. It's the story of a group of smugglers hired by the Rebellion who were instrumental in establishing the Rebel Base on Hoth." Looking at all of that, if you hadn't seen the sketch, this might actually sound like a pretty good pitch for a Star Wars movie. Or at the very least a comic or something along those lines. However, things go off the rails rather quickly in pretty amazing fashion. Goba speaks his alien language to the human crew that makes up The Mos Eisley Five. They speak "human" to him and everyone understands what one another is saying quite perfectly. Charles Barkley then calls this out, admitting that he can't speak anything other than "human" and finds this all to be miraculous. Unfortunately for his character, the language barrier puts him in some precarious situations as the sketch rolls on. This is something that has existed in the Star Wars universe for a very long time. Humans can understand droids through beeps, humans will speak basic to aliens, while they speak their language back to them and everyone just gets it. Many times, even in the movies, there aren't subtitles. The gist of what was said by characters like Chewbacca and R2-D2 is just explained with subtext or another character's response. This is something Star Wars fans have always just accepted, but Charles Barkley wasn't having it. On a slightly more serious note, J.J. Abrams singles out Ron Howard as the director of Solo: A Star Wars Story. 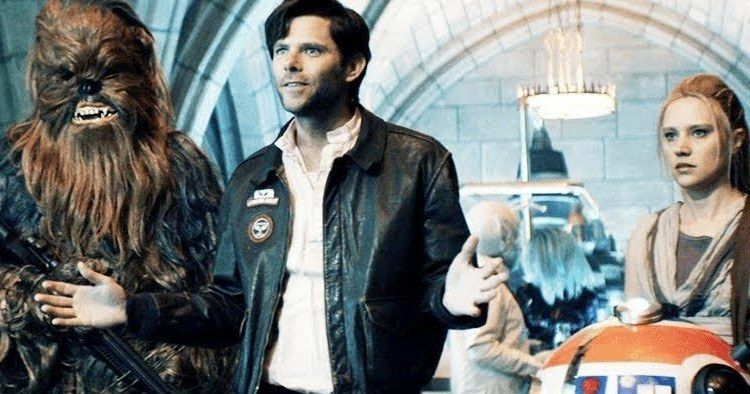 Phil Lord and Chris Miller were fired after shooting almost the entire movie, but Howard did significant reshoots on it, with some reports saying he re-shot as much as 80 percent. Whatever the case may be, he's clearly going to be billed as the sole director. As for how Lord and Miller will be credited? That remains to be seen. For now, you can just focus on this excellent and hilarious Star Wars sketch, which you can check out via the Saturday Night Live YouTube channel for yourself below.